In our last updates, we posted on how to make fast money on Google and now we will be describing how and ways to make fast money on Facebook just as we wrote earlier as you read on. 1. Facebook adverts: It is very possible to make fast or earn quick money on Facebook through its advertising programs where you pay few cents to promote the link of your product or website. With Facebook adverts, you can promote any kind of product or services for cash. If you have your hand made product or other people product, just create a free website for it and click on the advertising section on Facebook to create your ads. The more money you spend on the ads (e.g $5 per day) the more the people that your business will be exposed to. 2. Facebook page/groups: This is a program from Facebook which helps business owners create individual pages/create for their business. It helps in promotion and the best way to promote a business or link is through Facebook page/groups. The best way to make fast money through this is to post links of your product or business to get likes and share from people, your friends or followers. And you can create a paid advert on Facebook without a Facebook page. 3. Adsense: This is a program owned by Google which allows site owners to make money by allowing Google to display adverts on their site. You can make fast money from Adsense through Facebook by promoting links of your site on Facebook by boosting on Facebook advertising. The more you send traffic to your site through Facebook, the more clicks are generated o your adsense which brings good income to your. 4. Affiliate Marketing: This is almost the best way to make money online and can also be seen as the best way to make fast money through Facebook. You can make money with affiliate site by boosting links of your affiliate programs on your Facebook page with few dollars and get money when people click on the link and buy from the link through Facebook. The role of Facebook on this is traffic generation. 5. Sell Something : The best way to make money fast through Facebook is to sell something online and boost it with Facebook ads. You can sell your own product or other people's product like books, cars, electronics, cloths, shoes and nay kind of manterials. You can also use the Facebook paid advertising to promote links of business site, online businesses, offline business and to sell even unwanted items you no longer need online and make some money. 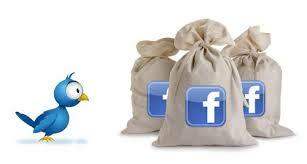 These are ways to make quick money on Facebook and brief description on how it works. You can see its very possible to make money fast through Facebook just like any other site on the internet. Thanks for reading.